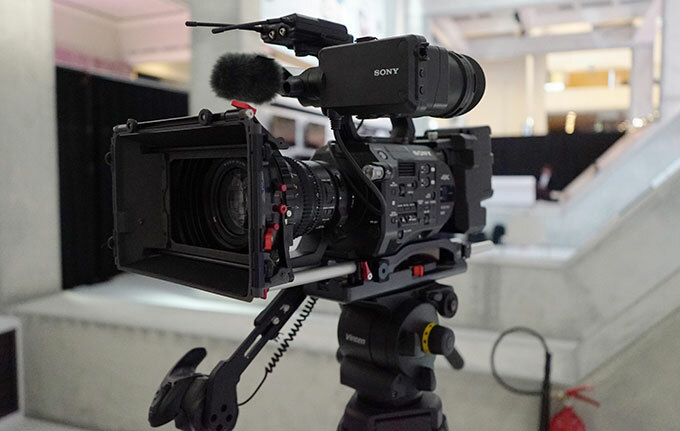 At IBC Sony launched a new camera. In fact Sony launched several new cameras. This is nothing new, every year Sony launch cameras. But this year Sony really created quite a stir with one camera in particular, the Sony PXW-FS7. So what is it about the FS7 that is so special? Looking at the specs alone this camera is nothing new. It has a Super 35mm sized 4K sensor - nothing new there. It records 4K using XAVC or via an external recorder it can record 4K raw. Again, nothing new. It can even record in HD at up to 180fps internally or 240fps in raw. Still nothing new. In fact the spec sheet almost mirrors the spec sheet of Sony's highly regarded PMW-F5 camera a camera that's been around for nearly 2 years. So what is all the fuss about? Well it's the price. With a list price of just 7200 Euros, which means after discounting a street price of GBP5,500 to GBP6,000 this appears to be the bargain of the century. But is it? The short answer is a resounding YES in my opinion. You see this camera actually shares more than just a very similar spec to the F5. It also shares a lot of the same electronics. For a start the sensor is the same very high dynamic range sensor as used by the F5 giving a whopping 14 stops of dynamic range. That's around 200%-300% more dynamic range than most 2/3" shoulder mount cameras. It records using the same 10 bit 4:2:2 XAVC codec as Sony's beautiful PMW-F55 camera. XAVC is now appearing in almost all of Sony's video cameras from the tiny AZ1 ActionCam point of view camera to the latest shoulder mount broadcast cameras. As a result you can now stay with the same codec no matter what type of camera you need, whether that's HD or 4K, normal speed or high speed. With the FS7 you have the choice of I frame only (XAVC-I) for easy decoding and post production work or the long GoP version (XAVC-L) for a much more compact file that takes up less space on the recording media, but needs a bit more processing power to decode. In either case the 10 bit 4:2:2 image quality is roughly the same. Don't want XAVC? Then you still have the good old XDCAM HD codec. It's only 8 bit 4:2:2, but XDCAM is considered to be one of the world's de-facto codecs for broadcast TV acquisition. But it doesn't stop there. You can purchase an optional extension unit for the FS7 (XDCA-FS7) that fits onto a special docking port on the rear of the camera. This extension module adds several extra features including genlock, timecode in and timecode out and the ability to record using Apple's ProResHQ codec, although you will have to wait for a firmware update early next year for this feature. All these codecs are recorded on-board using XQD cards. XQD cards are not new, they have been around for a couple of years, but until recently were not widely used. They are extremely fast and if you want to record high quality 4K reliably you are going to need fast media. Developed by Sony, SanDisk and Nikon XQD cards are readily available from places like Amazon at, lets say "realistic" prices. They are about half the price of SxS cards, still expensive compared to SD cards, but no more expensive than C-Fast and other similarly specified high speed media. A 32GB XQD card can hold around half an hour of 4K long GoP XAVC-L or 1 hour of 50Mb/s XDCAM HD or XAVC-L HD. Under the media compartment door on the left side of the camera there are slots for 2 XQD cards as well as a slot for an SD card. The SD cards are used for copying and saving data about the cameras setup or adding Look Up Tables to the camera (more on those in a bit). The XQD cards will function either in a relay mode where as one card fills up the camera automatically switches to the other slot or in dual record mode where both cards are recorded to at the same time to provide an instant media backup or second client copy. What else can the camera do? Design SSD's. Meanwhile the R5 records the raw on to AXS cards with 3:1 compression so a lot less media is needed. This also has a knock on effect in post production where the smaller Sony files are much easier to backup and easier to edit than the considerably larger 7Q files. Having said that the Convergent Design 7Q is a lovely monitor! "If you are struggling with media costs then I highly recommend the Nexto-DI backup products such as the NVS-2825. These self contained battery powered devices can rapidly and securely back up media such as SxS, P2 or XQD to hard drives on location and the cost of the device is often less than the cost of many hours of recording media. A 32GB XQD card can be backed up in about 6 minutes." Ergonomically this is an interesting camera. Without the extension module it's what I would call a "semi-shoulder" camera. It's not really designed to go all the way on your shoulder like a full size ENG camera. Rather perched on the front of your shoulder, a bit like a Sony EX3 or PMW-300. This design is a bit of a compromise. It puts some of the weight on your shoulder and gives an extra point of body contact which helps stability. It also puts the camera up high at eye level. But, a large part of the cameras weight will be taken by your right arm. However, unlike most shoulder cameras you don't need to have your arm and hand up at shoulder height as the camera has an articulating arm and handgrip that allows you to support the front end of the camera from a much lower position. I find a lower level grip much less fatiguing than a shoulder level hand grip on the camera or lens. The hand grip has a zoom rocker plus a couple of assignable control buttons, a small joystick and an assignable control wheel. If you use a Sony E-Mount zoom lens (such as the new 28mm -135mm power zoom) you can use the zoom rocker to zoom in and out. The assignable buttons can be used for things like focus magnification where the viewfinder image is enlarged to make focusing more precise. The joystick is used to navigate through the cameras menus to change settings on the fly without having to release or change your grip on the camera. Finally the assignable dial wheel can be used to control the aperture of an electronically controlled lens making exposure adjustments on the move really easy. The hand grip is a great feature and really makes the camera very easy and very fast to use. But to get the full benefit of it you want to use a Sony E-Mount lens. The E-Mount system is great, Sony now have a very wide range of high quality E-Mount lenses available. In addition you can use an adapter to convert from Sony's E-Mount to a multitude of other mounts. The most common adaptation is from E-Mount to Canon EF mount. Metabones have been making E to EF adapters that convert not just the mechanical mount but also the electronics for a couple of years. This allows you to use the majority lenses that have a Canon EF mount on a Sony E-Mount camera with almost no compromise. Aperture and image stabilization work as they would on a Canon camera. Auto focus normally works too, although the focus speed may be a bit reduced. Metabones also make a "Speed Booster" adapter that takes advantage of the fact that a Super 35mm sensor is a little smaller than a full frame DSLR sensor. This optical and electronic adapter allows you to use a full frame EF lens on an E-Mount camera, the full frame image is shrunk down to fit the Super 35mm sensor which means the image becomes 1 stop brighter and you get a wider field of view. If your budget is tight then there is a very effective electronic E-Mount to EF mount adapter from a company called CommLite that can be found for as little as GBP65.00. Also check out the offerings from MTF. If you add the optional extension module to the camera the balance of the camera changes dramatically. Without the extension unit the camera is powered by Sony's BP-U battery series. A BP-U60 will run the camera for about an hour and a half and these batteries slot inside the rear of the camera. When you use the extension module the camera is powered by V-Mount batteries that attach to the rear of the adapter. This pushes the weight much further back on your shoulder and if you add a base plate such as the Sony VCT-FS7 or the Vocas FS7 base plate the camera becomes a much better balanced and very comfortable shoulder camera. The down side is of course that the camera is now a bit heavier (the body only is 2kg, a full rig comes in around 3kg) but personally I'd rather have a slightly heavier but better balanced camera on my shoulder rather than a lighter camera where I'm supporting a lot of the weight with my right arm. At least with the FS7 the design lends itself well to many types of shooting styles, whether that's semi shoulder, full shoulder or cradled at waist height. The viewfinder, which is 960x540 resolution is attached to the camera via a thin arm that offers up and down adjustment as well as fore-aft adjustment but no left-right adjustment. It has a flip up loupe that is also removable. Personally I don't like the way this viewfinder is mounted, perhaps it will be improved when the camera ships, or 3rd parties will bring out better mounting systems. I found the operation of the camera almost identical to the Sony PMW-F5. There are some differences however. The FS7 does not have a 2K center scan mode for the sensor. This is used on the F5/F55 to eliminate aliasing and moire problems when shooting above 60fps where the cameras 4K native sensor is read out as a 2K sensor. On the F5/F55 if you don't want to use the 2K center scan mode you can fit a special 2K low pass optical filter that replaces the factory fitted 4K filter to eliminate aliasing above 60fps when using the full 4K sensor at 2K, but this is not possible on the FS7 so there may be a little bit of aliasing and additional moire when shooting above 60fps. Another thing the FS7 doesn't have is the large side display of the F5 and F55. For conventional shooting this is not really a big deal. But if you are using the Cine-EI mode where you may be using LUT's on different outputs not having this information clearly displayed is a bit of a nuisance. In fact during the shoot with the FS7 at one point I though I was shooting with a LUT when in fact I was not. The only way to be sure of how everything is set is to go into the cameras menu system. Like the F5 and F55 the FS7 has two distinct shooting modes. In custom mode the camera behaves pretty much like any other conventional camera where what you see in the viewfinder is what's recorded on the cards. You can create scene files where you can alter the cameras gamma curve choosing between standard gammas and hypergammas, alter the colour matrix and make changes to many other picture settings if you choose. But basically what you see in the viewfinder is what you get. The other mode is the Cine-EI mode, just like an F5 or F55 and very similar to the EI mode of an Arri Alexa or Red camera. This mode is designed to mimic the way a film camera works and in addition is designed to maximize the cameras dynamic range and image quality. In this mode the camera records using SGamut3.cine and S-Log3 (S-Log2 will come in a firmware update early next year). As the aim is to capture the maximum possible dynamic range in this mode the cameras recording sensitivity is locked to it's native ISO of 2000 (as you will only get the full dynamic range at the native ISO). As S-Log3 results in a very flat picture (that's great for grading and post work) the camera includes the ability to add a range of Look Up Tables (LUT's) to the viewfinder or HDSDI output. LUT's help you better judge exposure and give a more pleasing image prior to grading. LUT's can be used to give an approximation of how your footage will look after it has been graded. You can even generate your own LUT's in software such as Resolve (or Sony's new free Catalyst software) by grading a sample clip and then exporting the grade settings as a 3D Cube LUT. You then load the Cube LUT into the camera via an SD card. For exposure assistance the camera has a range of tools including a waveform, vectorscope or histogram display as well as zebras. Another way to use the LUT's is to "bake" the LUT in to your recordings. Normally the LUT's are only applied to one of the cameras two HDSDI outputs (the other HDSDI remains clean and outputs S-Log3), the HDMI output and the viewfinder output. But you can apply the LUT to your recordings so that they are no longer flat looking S-Log3 but have the look and style created by the LUT. This is a really easy way to produce a stylized look without the need to grade and without the need to be understand how scene files and picture settings work. But what about the image quality? Frankly it's amazing! For the money the images this camera produces are remarkable. It is using the F5's sensor and it does have 14 stops of dynamic range. S-log3 is a great gamma curve and the camera is very low noise, even at its native 2000 ISO. I shot with a pre-production camera in Amsterdam both on the Sony booth and in the city one evening. It was hard to tell as most of the shooting took place at night, but initially it doesn't look like there is any difference between the quality of the footage from the FS7 and the PMW-F5. Great colours, low noise, high dynamic range with very pleasing roll off, what more can you want? Because at normal frame rates (23.98, 25, 29.97, 50, 60fps) the sensor always operates at 4K, even if your just recording in HD, the images are sharp and crisp without the need for any additional sharpening or enhancement. This gives a very pleasing clarity to the picture and the contrast is also great. I shot with both S-log3 and Hypergamma 7 and in both case the highlight handling was amazing. The S-log3 material grades beautifully, allowing you to tailor the final look of your images in post. The Hypergamma 7 material looked great straight out of the box. One area where there will be a difference is with raw. The PMW-F5 takes the Sony R5 directly docked on it's back. The raw form the F5 is 16 bit while the raw from the FS7 is going to be recorded on an external recorder at only 12 bits. 12 bit linear raw is really pushing the limits of what is needed for linear raw. However we do already know that the 12 bit raw from Sony's FS700 works well, so this should be no different. The F5/F55 raw has more data in the shadows and low key areas so tends to grade a little better when you have large dark areas or deep shadows. Where this camera will be really good is when combined with the new 28-135mm f4 servo zoom lens. Typically parfocal lenses, lenses that hold the same focus distance as you zoom in and out, with this kind aperture and zoom ratio cost in excess of GBP25K. This lens will be around GBP2.7K. Being able to zoom in and out on a large sensor camera smoothly and without loosing focus as you do with most non parfocal DSLR lenses really increases the cameras flexibility. This makes it much easier and faster to use in run and gun type situations. The 28mm to 135mm power zoom is never going to be an incredible performer at this price and when wide open I did find it a little soft, but for shear ease of use it's really remarkable and very versatile. The FS7 combined with this lens will be a killer combination and that's why I have ordered one. It's NOT replacing my Sony PMW-F5, I love my F5 and I think that the F5 is the better camera for drama or studio type shoots. But the FS7 will be very handy for fast and fluid productions. It's compact size means it will be easy to transport on my travels around the globe. The light weight BP-U60 batteries will also be easier to pack in my carry on baggage for those times when I'm only using the camera body, without the extension unit. But the huge thing is the price. At street price of around GBP5,600 you are getting a camera that only a couple of years ago would have cost you close to GBP50,000. Unlike most other "cheap" 4K cameras there are very few compromises with the FS7. The sensor and image processing are superb, no restricted 8 bit outputs here. You have multiple codec choices. The overall build quality is great; you have a tough magnesium alloy body. Of course, as always a camera is just a tool. Owning an FS7 will not automatically make you a great film maker. But good tools make the job easier and when used right I see no reason why you couldn't shoot a high end blockbuster movie with this camera.